The artist Eric Ravilious lived and worked in Sussex. Known primarily for his watercolour landscapes and wartime studies, Ravilious was also a talented illustrator and designer. His paintings now regularly realise tens of thousands of pounds but examples of his ceramics designs for Wedgwood remain relatively accessible to collectors. Eric Ravilious was born in 1903. As a very young boy he moved with his parents from Acton to Eastbourne in Sussex. There his father ran an antique shop. Ravilious was educated at Eastbourne Grammar School. In 1919 he won a scholarship to Eastbourne School of Art and in 1922 to the Royal College of Art in London, where he met his lifelong friend and fellow artist Edward Bawden. Both men studied under the artist Paul Nash, who was generous in encouraging and promoting their work. Ravilious subsequently taught part-time at both art schools. In the early part of the 20th century there were attempts to address the separation between craftsmen and artists. Among the leading voices in this movement were William Rothenstein, principal of The Royal College of Art, artists like Paul Nash, Eric Gill, John Piper and Graham Sutherland, and Roland Penrose’s Omega Workshop, which involved the Bloomsbury artists Vanessa Bell and Duncan Grant. All these artists engaged with ceramics. In 1935 Eric Ravilious was invited by the Wedgwood factory to design a commemorative mug for the coronation of Edward VIII. After the King’s abdication in 1936, the design was reworked for the coronation of his brother, George VI, and subsequently for that of our own Queen Elizabeth II – both mugs are illustrated here. The designs give a reserved English voice to the joy and excitement that these coronations brought to our nation in the most wonderful way. Each monarch’s royal cipher and coronation date are set in bands of blue and pink, beneath cascading fireworks against a clouded night sky. The designs are modern and yet they capture the ancient in the subject, something that is often reflected in Ravilious’ work. There is a sense of continuity; this modern artist’s work sits comfortably in the evolving procession of English romantic painters from the late 18th and early 19th centuries, artists like John Sell Cotman and Samuel Palmer. These influences and qualities gift Ravilious’ work with a very English corrective to modernism’s extremes, expressed in his emotionally cool, structural paintings and designs. Today, George VI and Queen Elizabeth II coronation mugs like these could be bought at auction for around £600 and £120 respectively. The delightful alphabet mug illustrated was commissioned by Wedgwood in 1937. Banded in apple green, each letter of the alphabet is accompanied by a printed vignette; ‘A’ is for aeroplane, ‘E’ is for eggs, ‘O’ is for Octopus and so on. This mug would sell for about £350 at auction today. In 1938 Wedgwood commissioned Ravilious to design the ‘Travel’ pattern dinner service. It captures modes of transport in an enchanting way. The trains on the meat platter and plates leave a trail of smoke as they hurry towards us, contrasting the sailing boats, which seem almost becalmed in the gentle breeze. 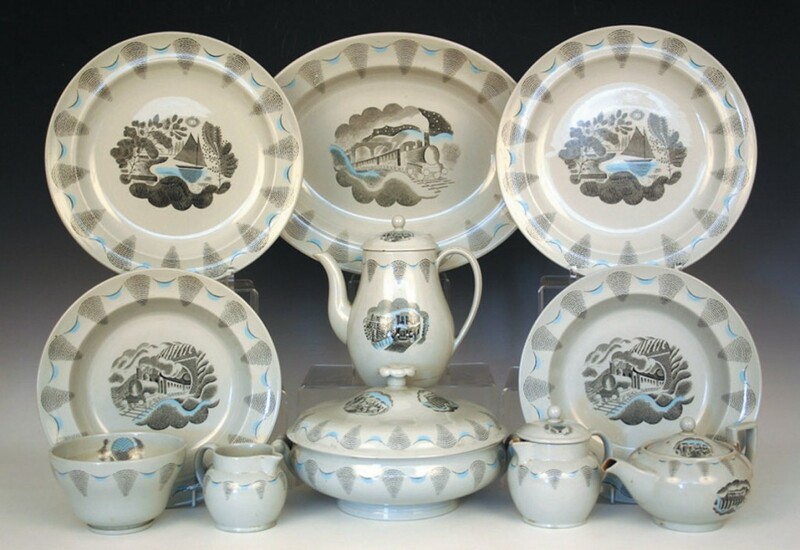 This small selection of Travel pattern dinnerware would sell in one of our specialist auctions for around £800. Eric Ravilious’ work continues to be reassessed and celebrated by art historians. Tragically in 1942, while he was working as a war artist, the rescue plane in which Ravilious was travelling off the coast of Iceland was lost. He died with the airmen for whom he had such respect. The body of work that he produced during his short lifetime is made exceptional by both its quality and Ravilious’ own very particular voice, expressed in paint, design and print. For the moment, the pieces he designed for Wedgwood represent an affordable way to collect examples of his work, but prices are set to rise. It seems to me that our current, somewhat fragmented, postmodern age is suffering from a cult of celebrity. Artists have not been immune from this and many have once again lost their connection with craft and design. Eric Ravilious and his fellow modern British artists enriched our lives in the interwar years of the 20th century, as they allowed their artistic voices to inform the manufacture and design of ceramics. Perhaps it is once again time to give voice to the artist as craftsman. By Revd. Rupert Toovey. Originally published on 19th June 2013 in the West Sussex Gazette. Postcards were printed lithographically, photographically and in letterpress, some were even hand-coloured or tinted. With such a rich diversity of photographers and printers, there is a rich variety of postcards to delight the collector. If your passion is social history, saucy seaside humour, vintage cars, topography, railways, churches or almost any other subject you can think of, there will be postcards for you. Due to Post Office regulations, postcards started out smaller than the familiar size most of us would recognise today. These ‘court-size’ postcards were only allowed to have the address on one side, so any message would have to be shared with the publisher’s image. In 1902 the Post Office changed their rules, allowing for the more traditional postcard size. At the same time a dividing line was introduced on the reverse, allowing space for the address and, for the first time, a message too, freeing up the entire front for a pictorial design. Postcard collecting was the hobby of many Edwardian ladies in particular but it waned with the outbreak and experience of the 1914-18 Great War. The light-hearted days, of which postcards had been an expression, were passing. There are plenty of interesting postcards relating to Sussex. Take, for example, the two postcards illustrated; both date from the time of the Great War. The first was part of a collection of postcards relating to Southwick in Sussex. The image was taken by the photographer Joseph Gurney Ripley. 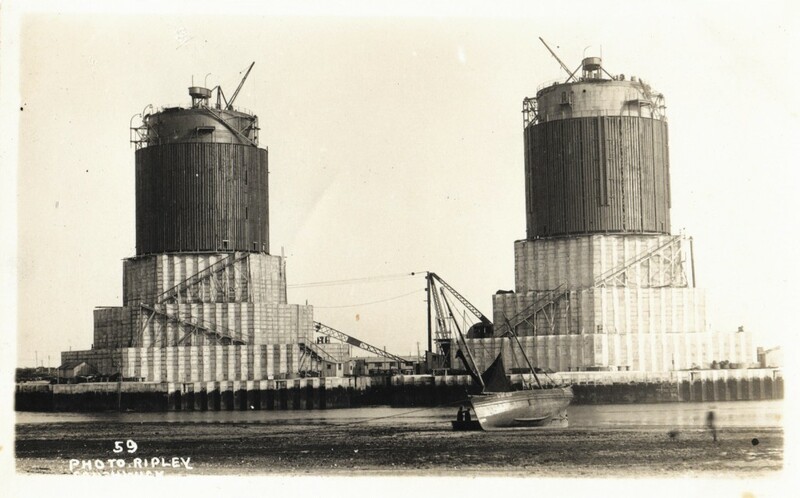 It depicts two huge structures, which were constructed at Shoreham and Southwick in Sussex. These forts were built as part of a proposed chain of twelve, which would have been sunk between Dungeness and Cap Gris Nez, to deter U-boat attacks along our shores. Building began in June 1918 under a cloud of secrecy and Sussex locals nicknamed them ‘The Mystery Towers’. The Armistice came in November 1918 and they were never deployed for their original intention, although they were still being constructed as late as 1920. One of the towers did become the Nab Tower off the Isle of Wight. The collection of 267 postcards sold at Toovey’s for £2,900. 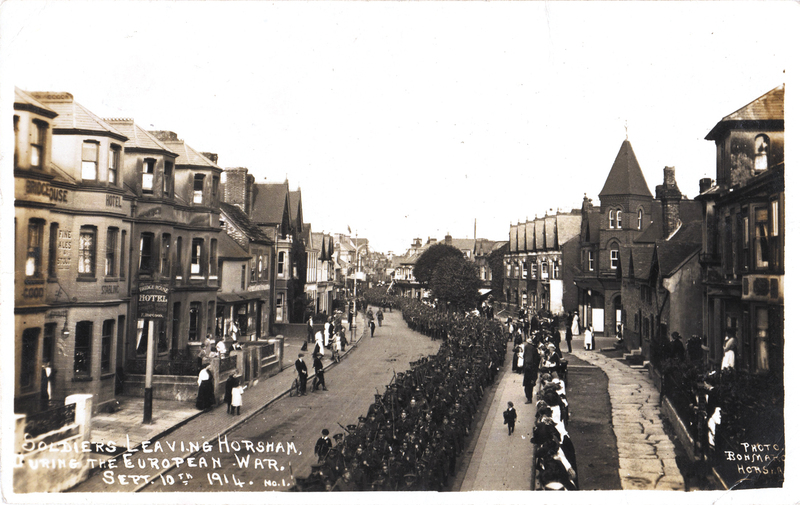 The second is titled ‘Soldiers leaving Horsham during the European War September 10th 1914, No.1’ and was published by Bon Marche, a company established by Frank C. Lewis, who in the years preceding the First World War became Horsham’s leading postcard maker. Many of these postcards are notable because of the quality of the photographs. Their images included towns and villages across the west of Sussex. A copy of this card could be bought today for about £15 at a postcard fair. Where should Sussex collectors begin if they would like to explore collecting postcards? “I’m always pleased to advise,” Nick explains. “The important thing is to see as many postcards as you can and compare one with another, so that you begin to be able to see differences in quality between images, publishers, subjects and condition and to see how these differences affect their value. When you are starting off, though, always ask advice. Those involved with postcards are usually delighted to share their experience.” Aside from Nicholas’s specialist auctions, the three main postcard fairs locally are held at Haywards Heath on the first Saturday of every month, Shoreham every other month and Horsham once a year. A valuable resource for postcards of Sussex interest is the website www.sussexpostcards.info. Whatever your interests, postcards provide an opportunity to acquire wonderful images and a glimpse back into the past. Toovey’s next specialist auction of postcards and paper collectables is to be held on 6th August 2013 and Nicholas is accepting entries until 3rd July 2013. By Revd. Rupert Toovey. Originally published on 12th June 2013 in the West Sussex Gazette. Thanks to the generosity of Mr Edwin Davies CBE, who gave his outstanding collection of Japanese Cloisonné enamels to the V&A, Horsham Museum & Art Gallery are going to display some of the finest, most jewel-like objects ever made. It was Davies’ vision that a selection of items should tour the country and with the help of the Victoria and Albert Museum, London, it is being made a reality. Horsham District Council’s Horsham Museum & Art Gallery is one of just ten venues nationwide that will be able to display these masterpieces of Japanese art and craft. The exhibition Japanese Treasures: Cloisonné enamels from the V&A opens on 15 June and runs until 22 September. The exhibition highlights the ability of a country in turmoil to create artistic masterpieces through the 61 objects on display at the museum. For the golden age of the craft was the era portrayed in the 2003 film The Last Samurai, when Japan’s old feudal society rapidly transformed itself. The craftsmen who made the celebrated Samurai armour and weapons were metaphorically not beating swords into ploughshares, but into exquisite enamels. Some of their patrons, the Samurai class, became acknowledged masters of this new craft, reflecting the degree that the society was changing. 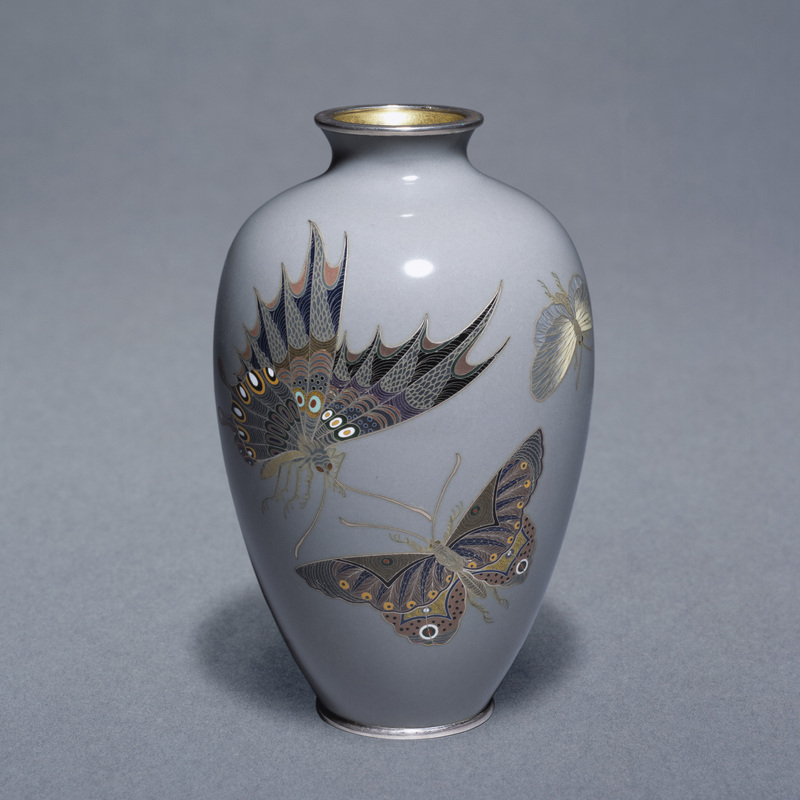 Over a century ago, as this revelatory exhibition shows, the Japanese were perfecting enamelling, the art of wire in-fills, of creating deeper colours, of polishing to a higher gloss the finished surface and then making objects that appealed to the west. 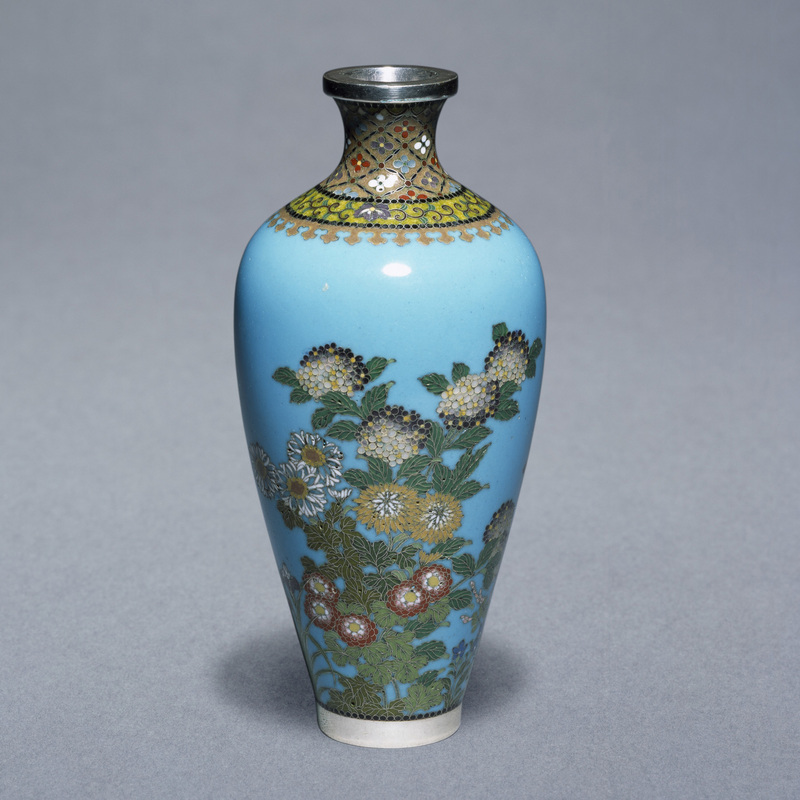 Enamel vases are decorated with Japanese images known to appeal to the western aesthetic: peonies, chrysanthemums, swallows, carp, dragons and butterflies are featured against a range of deep colours. Each item is like a treasure and so unsurprisingly whilst in the west we link the name to a manufacturing process, the cloisonné, in Japan, is linked to the ‘Seven Treasures’ mentioned in Buddhists texts. Horsham, an ancient market town noted for its stone roofs in the heart of Sussex, may seem a strange venue to host such an exhibition. Yet at the very same time the Japanese were creating these highly sophisticated superbly designed masterpieces residents of the town were visiting the remote lands. Robert Henderson and his wife Emma, who lived at Sedgwick Park, toured Japan, as the old order was being subsumed in a dash to modernise. They brought back photographs of the people and places to remind them, some of these will be on display. The exhibition itself would not have been possible without the good will and support of the local community including the auction house Toovey’s. Edwin Davies CBE, OBE is one of the V&A’s most generous benefactors and has been a trustee of the Museum since 2007. Until 2006, he was Chairman of Strix, a leading manufacturer of electronic heating controls for kettles and other water-heating appliances. The company won many prestigious export and innovation awards and Davies was awarded an OBE in 2000 for services to industry and a CBE in 2012. A prominent philanthropist, he has supported a wide range of institutions. The Victoria and Albert Museum, is the world’s greatest museum of art and design. It has been collecting Japanese Cloisonné enamels since 1867. Hans Feibusch represents a figurative tradition in 20th century art, which has sometimes been overlooked in favour of abstraction and other modern artistic expressions. He also has an important place in the history of a revival in church patronage of art in the Modern British Period. In 1929 Bell became Bishop of Chichester, bringing with him the patterns of worship and the arts from Canterbury Cathedral, where he had been dean. He wished to see churches filled once more with colour and beauty. Eternal truths could be proclaimed anew in music, modern art and poetry. More people would be drawn into the Christian community by the revival of this old alliance and renewed vitality. Among visitors to the Bishop’s Palace in Chichester were Gustav Holst, Vaughan Williams, Henry Moore, Hans Feibusch, T.S. Eliot, Vanessa Bell and Duncan Grant. Bell and Feibusch’s very particular friendship blessed Sussex with a number of murals by this artist, which can be seen at St Wilfred’s, Brighton, Chichester Cathedral, The Bishop’s Chapel, Chichester, and St Mary’s, Goring-by-Sea. Painting onto the walls of churches and cathedrals requires painstaking preparation and the pencil cartoon by Feibusch shown here gives us a valuable insight into his work. 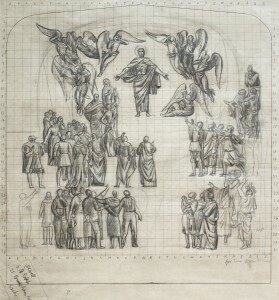 It is a sketch for the mural ‘Christ in Glory’, painted in 1957 at St Sidwell’s, Exeter. Most striking to me are the prompts from Feibusch’s earlier works in Sussex. 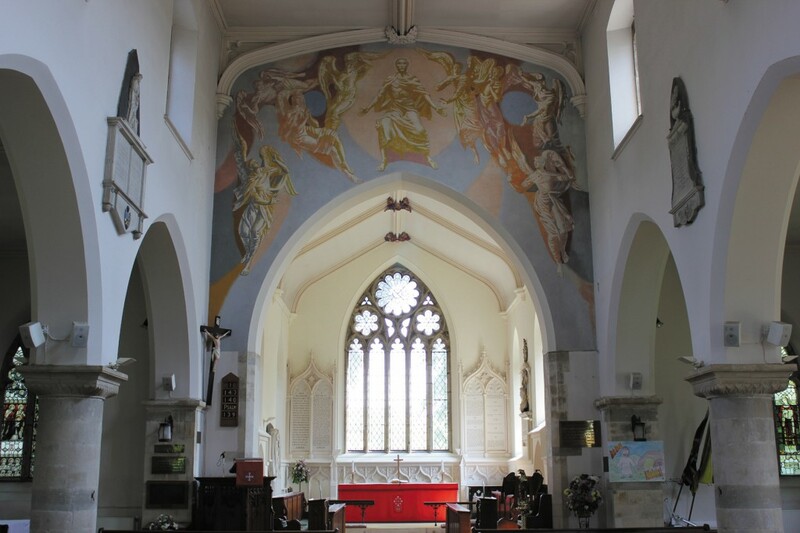 ‘Christ in Majesty’, also shown, was painted in 1954 at St Mary’s, Goring-by-Sea. Like in the sketch for St Sidwell’s, it displays Feibusch’s knowledge of Renaissance artists, whose influence is displayed in this mural. The Mediterranean lilac-blue, ochre and terracotta hues serve to emphasize Christ’s own pose, his arms open in a gesture of welcome and embrace. The figures are convincing, almost sculptural, with a quality of mass and light. Feibusch’s painting gifts them with a grace and nobility through their poses, which to some can seem to deprive them of life and passion. At first glance there is little that is unexpected but, as we look more closely at the angels, we note that the expressions on some of their faces are less angelic and more mischievous, acknowledging his depth of insight into the human condition, which can reflect good and evil. In the St Sidwell’s sketch, men and women look up to Christ with gestures of praise and thanksgiving, reminiscent of the figures painted in the Ascension scene painted by Feibusch in the Bishop’s private chapel in Chichester. While the attention of the art world moved on to focus on the abstraction of Ben Nicholson and the new depiction of naturalistic forms by artists like Henry Moore and Graham Sutherland, Hans Feibusch continued to paint and draw in his own particular figurative style, influenced by the Renaissance. His style of painting has been the subject of renewed interest in recent years, with retrospective exhibitions held at Pallant House Gallery, Chichester, in 1995 and more recently at the Bishop Otter Gallery, University of Chichester, in 2012. The murals deserve to be celebrated. They represent the work of a gifted artist whose life is inexorably bound up with the extraordinary history and events of his time. For me, though, it is Feibusch’s sketches and drawings that reveal his true talent. Hans Feibusch’s work rarely comes to the market and so it is with some excitement that I am looking forward to Toovey’s specialist fine art sale on Wednesday 12th June, in which the St Sidwell’s ‘Christ in Glory’ sketch and a number of other studies and prints by the artist will be auctioned. By Revd. Rupert Toovey. Originally published on 5th June 2013 in the West Sussex Gazette. In 2012, Rupert Toovey and Jeremy Lamond founded Oxford Conferences Limited. It was established to deliver excellence through education and dialogue and is the only independent provider of continuing professional development for professionals working in the art and antiques industry. The inaugural conference was held in September 2012 and offered delegates a series of lectures at the Ashmolean Museum, Oxford. This year a conference exclusive to the art and antique professional will be held on 13th and 14th September. Further events for private individuals are in development. 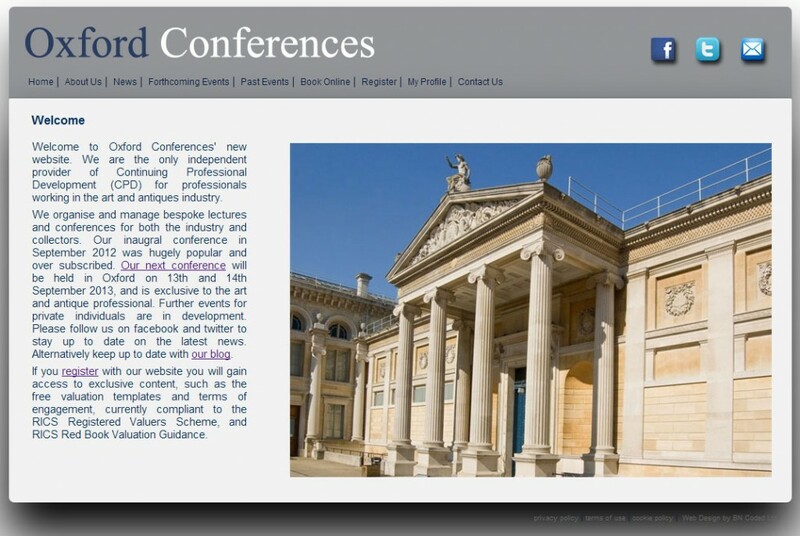 Oxford Conferences has recently launched its new website, visit www.oxfordconferences.org for more information.